Chocolate chip cookies are the perfect way to make friends. At least, Mark Daniels thinks they are. He hopes to forget his painful past and start over in new neighborhood. Everyone is warm and welcoming—everyone that is, but the dragon lady next door. She rebuffs all overtures of friendship and declines Mark’s invitations to church. Jasmine Avery doesn’t trust men, especially not handsome ones who come bearing gifts. She’s been badly hurt and has walled herself off from love. Reluctantly, she agrees to attend church with Mark on Easter Sunday, not realizing how it will change her life and her future. But soon after she discovers the secret to a happy life, her whole world turns upside-down. Will these unexpected changes prove Mark can’t be trusted either? Or can she and Mark overcome their past heartbreaks to forge a new life together? Inspirational author Rachel J. 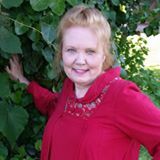 Good writes life-changing, heart-tugging novels of faith, hope, and forgiveness.She is also the author of the Sisters & FriendsAmish series and the Amish Quilts Coloring Book. A former teacher and librarian, she has more than 2300 articles and 30 books in print or forthcoming under several pen names. Rachel also juggles freelance editing and illustration careers. She loves reading (of course! ), traveling, and spending time with her five children and three grandchildren. Angels Unaware was a beautiful story of forgiveness and the purpose of Christ’s death on the cross. I enjoyed learning about the difficult pasts of the main characters Mark and Jasmine. They were both realistic people with believable flaws. However, I had trouble relating with Jasmine. The book is set in Mark’s point-of-view. In doing so, I think we lost a chance to relate to Jasmine. She is not a likable character which in turn made her dramatic transformation unbelievable. I wanted to know more about what was going on in her mind, how she viewed Mark, and why the message of the cross changed her. There was a lack of chemistry between the characters that could have been remedied with more description of facial expressions, body language, and appearance. The relationship moved fast and I had a hard time understanding how they went from dislike to love. By the end, there were many unanswered questions and unsolved subplots.This book did have invaluable lessons reminding you to look deeper beyond your first impression, for there is often more to a person than what they first appear to be. I would give this book three out of five stars. I was given a complimentary copy of this book in exchange for an honest review. All thoughts are my own. Thank you for your honest review ! I think I would like to read Rachel’s Book ! Heart breaks of the past. Well, I guess that is so many people and overcoming them is not easy. I can relate to the theme of this story of moving on from the past. Even though I forgive trusting again is harder.